Campsite with direct access to the beach. Ocean lovers will be right in their element! The old paved causeway that crosses the tidal mudflats from the mainland may look like the best way to approach the island of Noirmoutier. But the Passage du Gois is only open at low tide, so campers crossing from Beauvoir-sur-Mer need to beware, even if the trusty satnav cheerfully insists on guiding drivers along the causeway as waves lap around the wheels. Fortunately there’s also an impressive toll bridge that arrives at the southern tip of the long, low-lying island, which feels a lot further south than it has any right to. Given that it is only a little south of Brittany, 30 miles (50 km) below the mouth of the Loire, Noirmoutier can feel almost Mediterranean, especially when there’s no fresh Atlantic westerly blowing and there’s barely a ripple of water disturbing the reflections of the pleasure boats across the sheltered bay. The Impressionist painter Renoir was drawn here in 1892, attracted by the mild climate. No doubt the whitewashed Midi-style villas, with their terracotta tiles and blue shutters, appealed too. However, his best-known work from the visit, ‘Noirmoutier’, looks remarkably like the pine and green oak trees, and sandy scrubland would have been here in the Bois de la Chaize long before the Huttopia chain’s brand of sites brought campers to the coastline. 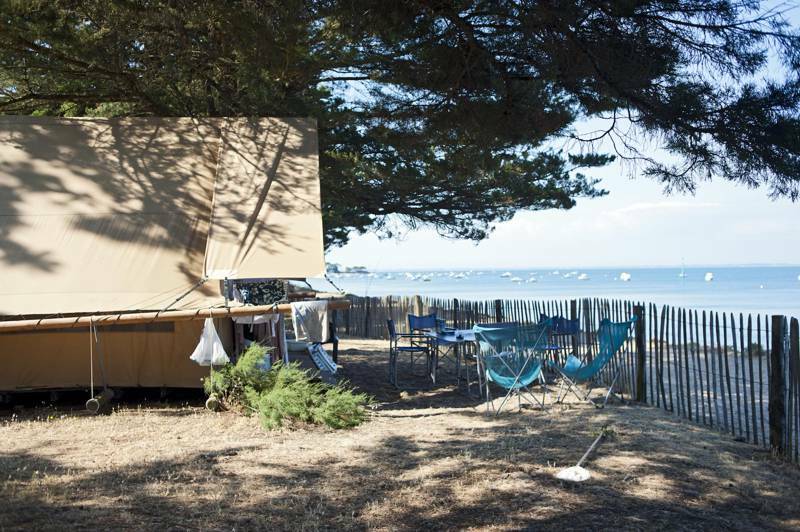 to appropriate for drying towels, separates the sandy shoreline from the sand you pitch your tent or park your caravan on, with the option of pine-tree shade or full sunshine, depending on how desperate you are for du soleil. And a lovely beach it is, too, sweeping around the wide bay and along the coastline of the northern half of the island, in case you fancy a really long walk before breakfast. The appeal of the site centres on this beach and its relative proximity to the island’s town, Noirmoutier-en-l’Île. There’s a short cut to it through a nature reserve that’s ideal for bike-riders and hikers, but cars are obliged to meander around a longer route before they reach a pleasant town with sleepy sun-bleached streets, a dry-moated 12th-century castle, a Romanesque church, and plenty of cafés and restaurants. Here you can fortify yourself for a trip to the great beaches and villages on the north side of the island – Plage des Lutins, close to L’Herbaudière, is a real surfers’ favourite. A roulotte (gypsy caravan) close to the site’s reception serves chips, pizzas, and sandwiches, but BBQ-ing or home-cooking is most popular, especially around the stylish wood-and-canvas Canadian-style tents (of which there are 80). At low tide hundreds of people may scour the beach with rakes and buckets in search of oysters, cockles, and clams. Campers do it, too, but a cheap and equally cheerful alternative is to buy the local fishermen’s latest catch in town, or stop at one of the excellent roadside cafés selling huîtres (oysters) or moules (mussels), while crossing the island. Often these can be found right next to the salt marshes, which formed the backbone of the local economy (a quarter of the island used to be salt marsh), and provide great viewing points for egrets, avocets, shelducks, and other migratory birds. After your seafood supper, suitably enriched with local fleurs de sel salt and Breton cidre, you can simply sit and watch the sea as the subtle blues, pinks, and purple-greys merge around the horizon, because there’s really no need to rush around here, unless you need to catch the causeway at low tide. 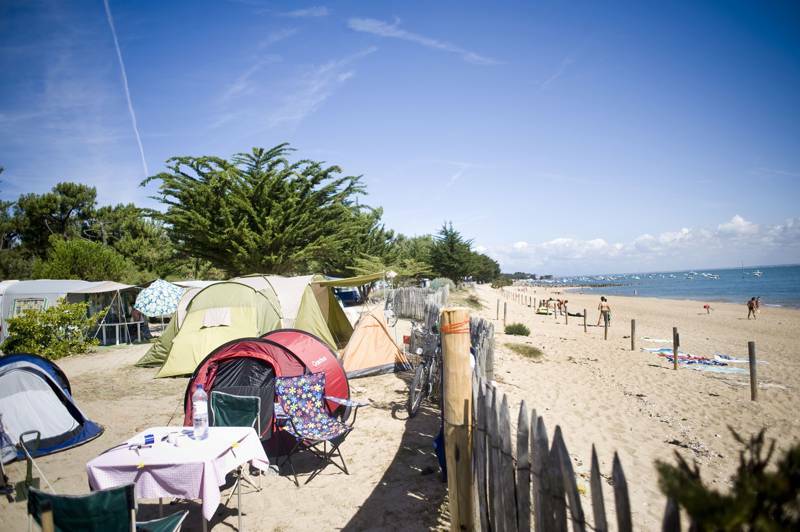 The Huttopia Noirmoutier campsite is ideally located alongside Sableaux beach. For latest availability and best prices for Huttopia Noirmoutier, please use the Date Search above. For a site with 500 pitches, the kids’ play area is relatively small. The nearest shop is outside the municipal campsite, not far from the main gate, with more supermarkets to be found further into Noirmoutier-en-L’Île. There are 5 wash-blocks, with plenty of hot showers, toilets, and stylish washing facilities, though some women, when asked, said they would definitely prefer it if the showers were not ‘mixed’ areas. Jetons (tokens) for washing machines are available from reception, where bike-hire and wi-fi access is also available. BBQs are fine, but campfires are not allowed on site, nor on the beach, though people do light their own beach fires. There are bike trails across the island, some of which are cycles-only, criss-crossing the Marais salt marshes. When there’s not enough excitement to be had on the beach, the water chutes, slides, torrents, and geysers at the Océanile Aquatic Park (00 33 2 51 35 91 35) should deliver it. Alternatively, there’s surfing and kite-surfing, sailing, fishing, horse-riding, or kayak and canoe hire to help you discover the labyrinthine Routes du Sel (the salt routes). And there’s a nature reserve that’s great for spotting sea- and marsh-loving birds next to the site. There’s a boulanger who comes to the site each morning at around 8.30am with fresh bread and croissants. Make sure you buy, catch, or collect some seafood, whether it’s covered in scales, shells, or exoskeletons, to eat on site, preferably after an aperitif of Pineau made in the Vendée or the Charente. Among the many restaurants in Noirmoutier-en-I’ÎIe, the ivy-clad Le Grand Four, right next to the castle (00 33 2 51 39 61 97) comes highly recommended for gastronomic thrills (menus from €23). Or try the family-friendly seafood and crêpes selection at Le Transat (00 33 2 51 35 72 27), which has a very friendly atmosphere and offers panoramic views over the port of L’Herbaudière, about 3½ miles (6 km) from La Vendette. A pitch (tent/caravan/motorhome, 2 people, vehicle) €21.20 (€31.50 in high season) or €19.20 (€32.90) for a beachside position, which is cheeky. Each extra person is €4.20 (€6.30), kids from 4–10 years are €4.30, but babies are free. 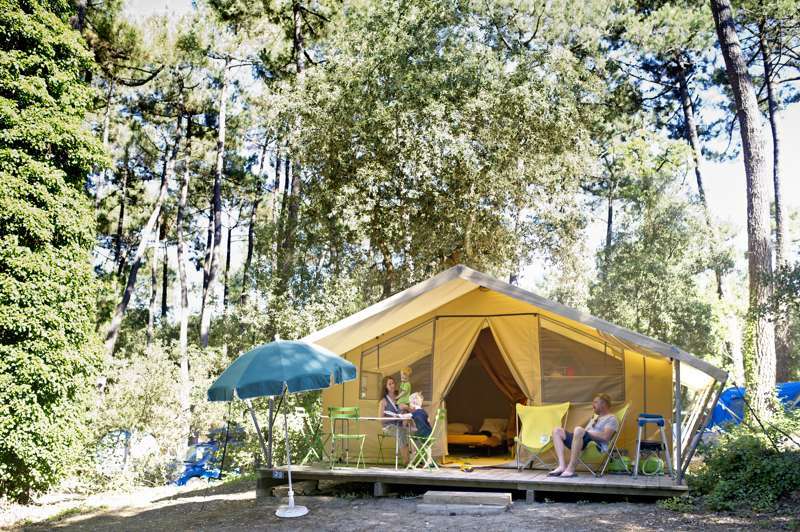 If you’re planning to stay for longer, consider renting one of the Canadian-style tents, especially before or after the French holidays (the last week of August), when there are special promotional deals. By car: From Nantes, take the A83 in the direction of La Roche sur Yon, then take exit 1 La Roche sur Yon. Follow the D178, and then the D117, towards Ile de Noirmoutier. Once on the island, take the direction of Noirmoutier en l’île and then follow the blue signs for “Campings” or the signs for “Les Sableaux”. The Huttopia campsite is at the end of Rue des Sableaux by the sea. Please note that Gois passage can only be taken at low tide (from 90 minutes before low tide to 90 minutes after it).